Ahhhhhh, now that's how you make Black Raspberry ice cream. There are so many great flavors out there, but a good BR holds a special place on my top ten, and a nice one like this makes me want to toss out the one from Stone Ridge. A little harsh, but the thought has crossed my mind. So, what do you get? a fantastically sweet, yet not to tangy, bite of BR bliss in every spoonful. Black raspberry is meant to be simple, sweet, and understated. I just can't complain when an ice cream hits the spot like this. The only possible, small, miniscule complaint I could come up with is that I wish they would turn this into one of their All Natural flavors. That would get rid of the extra stuff and take that creamy texture all the way. If they did that, I would probably always have to keep one on hand (hint, hint). Sounds delicious! Raspberry ice cream - yum! I'll second the request for an All Natural version! Flavorless! 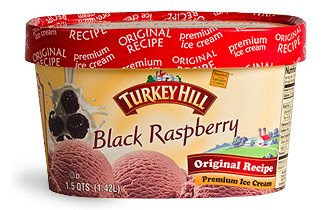 If you were blindfolded you wouldn't be able to tell it's supposed to be black raspberry or any berry for that matter.